Chalet Morzine is a fantastic find for style-savvy skiers considering hitting the slopes with a little one in tow. Not only is this 7-bedroom chalet stylishly furnished and expertly run by friendly ex-pat couple Emma and Olly, but it also comes with their mini-host and son Luc (born 2007) too. Novice snowboarder and frequent playmate to guest toddlers 'Luc' is also chief tester for the baby gear, nannies and child-friendly services (See grey box below) available at the chalet or surrounding area. As a result, BFB guests can be confident that the management are exceptionally well-versed in the needs of young families and very happy to offer advice and arrange services from nappy packs and nannies, to lift passes and ski boots! Little ones will love the balcony hot tub overlooking the winter wonderland below, and the downstairs playroom, equipped with enough movies, games and toys to ensure they are entertained, occupied and, even, educated at all times. The room is easily converted into a crèche with nannies, or grown-ups cinema room. When not working their way through the huge film collection, adults tend to appreciate the hot tub, sauna and sociable dining room with honesty bar, where the chalet's talented chef cooks up delicious home-made dinners and fresh baked breakfast pastries, all with free flowing wine or coffee. 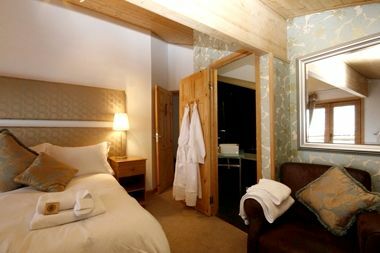 The seven en-suite bedrooms are arranged around a spacious central lounge area with real log fire, which makes the ideal spot for some quiet relaxation and recounting the day’s activities. There's one family bedroom with double and two singles, and six rooms for two with zip n' link beds making twin or super king, all have space for a cot/additional child bed. The lovely 100% Egyptian cotton sheets, over down duvets and pillows can be very hard to leave but the modern bathrooms (all en-suite) with their invigorating showers and luxurious fluffy towels soften the blow considerably. 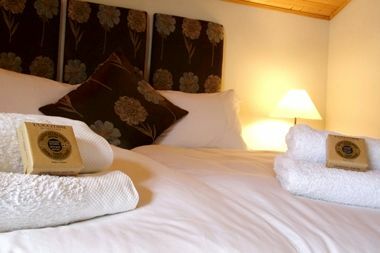 Sleeps 3+cot in 1 large double room with space for a child's bed & a cot. A second child bed may be available on request. The chalet is approx. 80-minutes from Geneva airport. The Chalet works with two private nanny companies who come to the chalet and look after the little ones. There are lots of bath toys, kids books, general toys (boxed by age), buckets and spades, ride-ons, trikes a sand pit, paddling pool and play house etc. Pre arrival shopping is offered. There is a hot tub and Sauna in the Chalet. There is an excellent local crèche - L'Outa in the centre of Morzine, right by one of the main ski lifts. In the winter season the chalet is fully catered with a proffesional chef, plus if requested a children's supper which is either homemade baby purees or pizzas etc which the children are encouraged to help make. 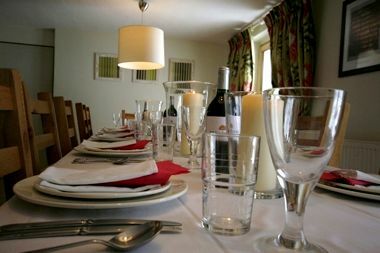 In the summer a catered service, self catering , B&B or one pot meals can be arranged. The chalet has a log burning fire. The chalet has an onsite hot tub.